The first overall draft pick in 1988 made an instant splash in the NHL, finishing second in Calder Trophy balloting, though the player he lost was the 31 year old Russian, Sergei Makarov who many thought should not have been eligible for the award. While Modano’s star was rising, the North Stars would relocate to Dallas and the Michigan born player was set to become the face of hockey in the state of Texas. The city of Dallas loved their new team and embraced Modano as their new sports celebrity. It was Modano who would be the leader of the Stars and take them to their first (and to date only) Stanley Cup win in the 1998-99 campaign. 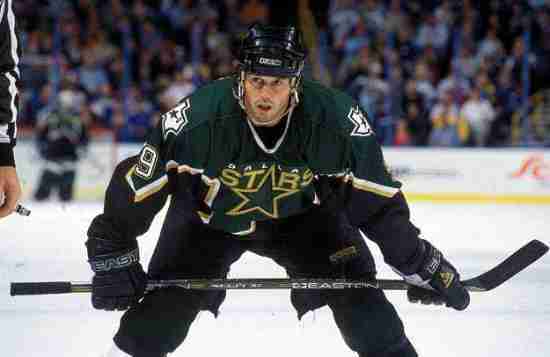 While this was Dallas’ only win in the Holy Grail of Hockey, Modano did take them to another final the year after. Modano would retire with the most points ever by an American and made hockey relevant in a place where many thought impossible. Seriously, who else could we have possibly picked? Acquired: Drafted in the 1st Round, 1st Overall, 6/11/88. Signed as a Free Agent with the Detroit Red Wings 8/5/10. See More Info about Mike Modano on Everipedia!